10 week training schedule - from couch to cycling 1000km! 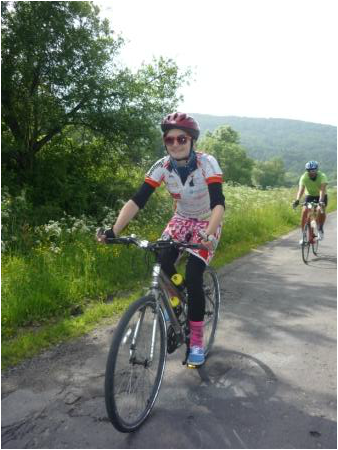 Wondering how to train for Cycle Poland? Here is our suggestion for a 10 week training plan. Start off by... shopping. Yes it helps. Get a bike computer. It doesn’t have to be anything fancy, just something that tells you how far and how long you cycled, and how fast you are going. It will help to motivate you, and to track your progress. The training schedule is divided into 6 types of rides to give a bit of variety - see the end of the schedule for an explanation of each type. The weekday training rides are to be done in a given time over no specific distance. The weekend rides are to be done over a distance with no specific time. As the training goes on, the times and distances get longer. Good thing the days get longer too! The most important thing is that you enjoy your riding. 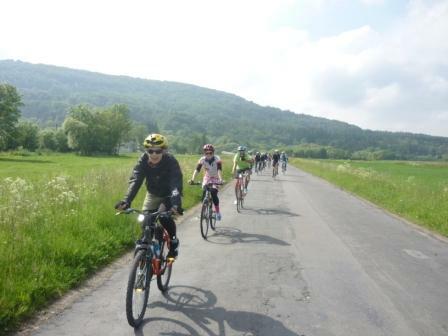 Pick a beautiful spot to cycle to, explore your neighbourhood, ride with friends, reward yourself with an edible treat when you've worked hard ... or join us on one of our organised training rides for some good company and a pleasant route. Just what it sounds like. This is a time to find out what your "normal" pace is. Take the bike out and ride at an easy, comfortable pace. There should be little effort on the flats. You should work a bit going up rises and into the wind. Check your speed a few times during the ride to make sure it doesn't drop off too much. That can happen on an easy ride if you're looking around and enjoying yourself. The Weekend ride - The weekend ride has no specific work-out component. It's just a ride for you to get out on the road and enjoy yourself. Consider the distance you're aiming for today and think about where you would like to go to make up that distance. It's good to have a goal and a reward in mind before you start out. A coffee shop, a store, a town, a place with a nice view, a creek where you can picnic or someplace you've never been before. Be sure to carry water and/or powerade. Take snacks and a phone (this is especially important as your rides get longer). Check the weather report and carry appropriate clothes. Ride easily for 8 to 10 minutes to warm up then do a sprint. Pick a spot (a tree, a rock, a clump of dirt, a cross road, a sign) about 150 to 300 or 400 yards ahead. Race to that spot as hard as you can. Resume your easy pace for 8 to 10 minutes and keep repeating the pattern. It helps to do your sprints in different conditions, uphill, downhill, with and against the wind. An alternate to picking a spot to race to is to pick a time of 30, 60 or 75 seconds and go as hard as you can for that long. Finish the session with an easy pace to cool down. Ride easily for 8 to 10 minutes to warm up. Note your speed. Ride 2 Km/H faster for about 2 minutes followed by about 2 minutes of your easy pace. Next ride 4 Km/H faster for about 2 minutes followed by about 2 minutes of your easy pace. Continue the pattern, increasing the push speed by 2 Km/H each time until you can't hold the speed 90 seconds. Then take the rest of the ride at a leisurely pace except for 1 sprint about 10 minutes before you finish. Before doing this ride work out what is your normal/average riding speed (what you'd do on an easy ride). Take a short warm up ride then add 2 to 5 Km/H to your normal riding speed and try to hold exactly that speed for as long as possible. Hold your speed up hills, down hills and on the flat. Don't just coast down the hills, gear up if you have to and keep your legs moving with slight pressure on the pedals but don't push or speed up more than the slope dictates. If you reach the point where you can't hold your chosen pace anymore, relax and finish the ride at an easy pace. If you reach your time limit before you run out of energy then you should increase your normal/average riding speed. If you can find a section of road with rolling hills that would be great. Longer hills are better than steeper hills but a steep hill isn't bad either. If all you have nearby is one hill then this is going to be only slightly more interesting than riding a stationary bike. Try to maintain your normal cadence (foot speed) while climbing a hill. It's your foot speed that you're trying to maintain, not your road speed. Gear down for the climb as soon as you feel your foot speed start to decrease. Waiting too long to gear down can cause problems. Hill climbing can be as much an exercise of balance as of strength. To maintain your cadence, gear down as much as you need to. Your speed will drop and it may become hard to hold a straight line. Work on it. To change things up, try standing on the pedals to do your climb. Standing on the pedals works a different set of muscles and you can burn yourself out quickly if you're not used to it. If that is the case with you then try incorporating some stand-up pedalling into your other rides. Add a little at a time. When you reach the top of the hill don't rest. If you rest you'll cool off too much and chill on the way down. Take your rest as you coast down the hill. Now it's time to climb the next hill and the next (or the same one again and again if you've only got one).